Ricky Burns says his clash with former British Lightweight Champion Scott Cardle is the definition of a must-win fight for both men. The Scottish duo meet on the undercard of Tony Bellew’s highly-anticipated undisputed Cruiserweight clash with Oleksandr Usyk at Manchester Arena, live on Sky Sports Box Office in the UK and DAZN in the US, knowing the winner will be set for a big 2019 with major title fights on the cards. A slip up for either man would spell disaster, with the loser facing a tough Christmas period knowing that a long and hard road back to title contention would lay ahead of them. Burns won his 50th fight as a professional in June, stopping Croat Ivan Njegac after four rounds and returns to the scene of his October 2017 points loss to Anthony Crolla determined to prove he has plenty left in the tank. The ‘Rickster’ still harbours dreams of fighting for World titles again and a rematch with Manchester favourite Crolla is top of a list of fights he wants as he prepares to write new chapters in his fantastic journey. 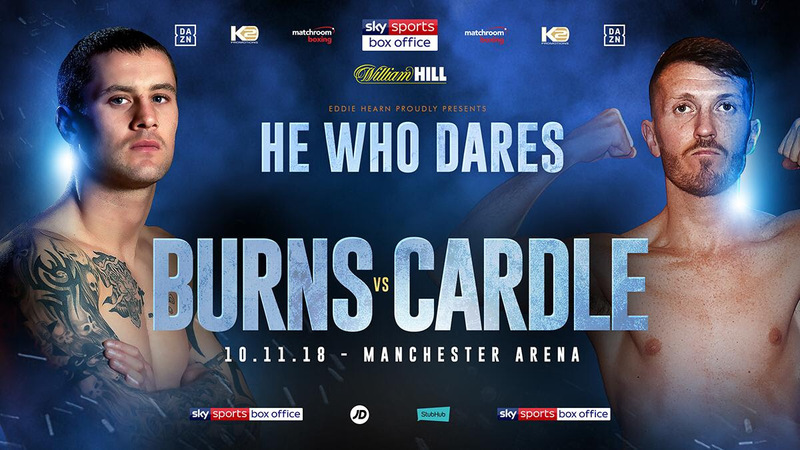 “There’s some big fights to be made in the Lightweight division and a win here in front of such a large PPV audience will put me further in the frame for next year,” said Burns. “The Manchester crowd last time out was fantastic and obviously Anthony Crolla is fighting on the bill, I’d still love that rematch down the line but first and foremost Scotty has my full attention. “Training has gone really well, I’m always keeping busy in the gym waiting for the phone to ring. It doesn’t matter who I fight, I train for every fight the same so the short notice doesn’t change anything drastically in terms of our preparation. These domestic dustups get the fans excited and it’s a great show to be fighting on. “It doesn’t matter who I fight, I train for every fight the same so the short notice doesn’t change anything drastically in terms of our preparation. We had to bring forward the last spar and start an earlier weight cut but I’m more than ready to go. “On reflection it’s been a tough year but that’s boxing, sometimes you don’t get the breaks and it’s a bit of a waiting game. I’m not oblivious to the fact I’m coming to the back end of my career, but there’s still life in me yet. Just ask the lads who I train with day in, day out. Main event on a huge night at Manchester Arena sees undisputed Cruiserweight World Champion Oleksandr Usyk put all of his belts on the line against Tony Bellew. Manchester favourite Anthony Crolla faces Indonesian Daud Yordan in a final eliminator for the WBA Lightweight World title, undefeated Cruiserweights Sam Hyde and Richard Riakporhe clash for the WBA Inter-Continental title, slick Team GB 2016 Olympian Josh Kelly returns for his eighth professional contest against Walter Fabian Castillo, Ukrainian Olympian Dmytro Mytrofanov features and popular Yorkshireman Dave Allen continues his rebirth in the Heavyweight division.